Lechón is a popular food in the Philippines. In fact, lechón is the country's National Dish. It is prepared throughout the year for any special occasion, during festivals, and the holidays. The word "lechón" actually originated from the Spanish term "leche" which means "milk", thus lechón refers to a suckling pig that is roasted. The dish usually features a whole suckling pig grilled over charcoal. But nowadays, the original use of a suckling pig has given way to a medium-sized adult pig. Preparation of lechón is quite simple; after the entrails are removed, the pig is seasoned with spices which may include: "tanglad" (lemon grass) or "dahon ng sampalok" (tamarind leaves). It is then skewered in a long bamboo stem, grilled over a pit filled with hot charcoal fire and turned in a rotisserie action. The pig is roasted on all sides for several hours until done. The process of cooking and occasionally basting it with cooking oil usually results in making the pork skin crisp, giving it a distinctive aroma and mouthwatering taste. Over the years, and just like any popular dish, the lechón also evolved. Aside from the use of pork, the lechón manok (grilled marinated chicken) has become so popular a dish in recent years that the business of lechón manok has mushroomed through out the Philippines, that every street corner is now filled with the likes of the more popular chains of Andok's and Baliwag Lechón Manok, and the list goes on . . .
And quite recently, the city of Davao has caught much the attention of the public, and of course, the Philippine media, because of a different kind of lechón - the notoriously talked-about Lechón Buwaya (Roasted Crocodile). 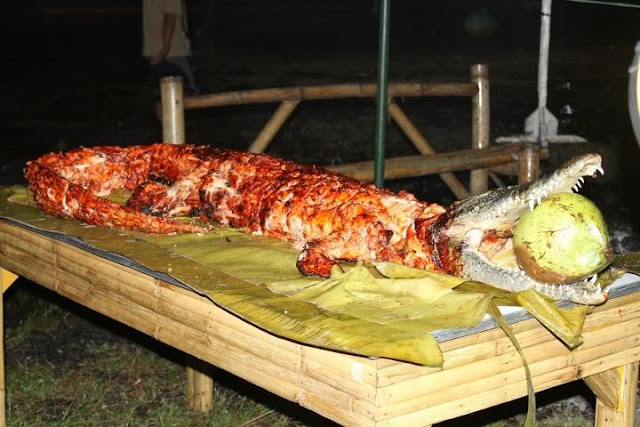 In October 2011, the Davao Crocodile Park launched its "Croctoberfest 2011" in Davao City where saltwater crocodiles were roasted in the traditional way of cooking lechón. These were farm-bred saltwater crocodiles whose skins are usually sold commercially for leather and their meat for food consumption. 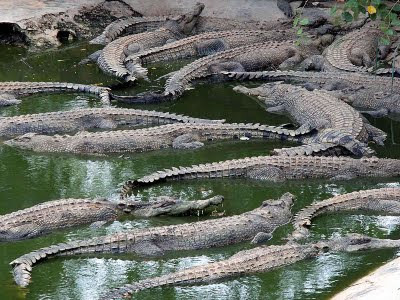 The Davao Crocodile Park secures special permits from the Philippine Department of Environment and Natural Resources (DENR) before these farm-bred crocodiles are slaughtered for commercial or food purposes. Crocodile meat is found to be low in fat, low in calories, and high in protein, and looks like a cross between roasted beef and pork and tastes like chicken - a little grainy but tender and just right. The price may well be prohibitive at PhP2,000 per kilo, but there are many of those who regard it as a delectable fare. 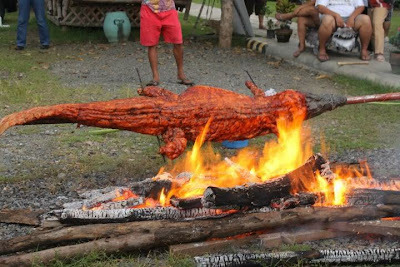 The whole crocodile was marinated overnight in beer, pineapple and calamansi juice, coco syrup, chillies, pepper corns, and various spices. 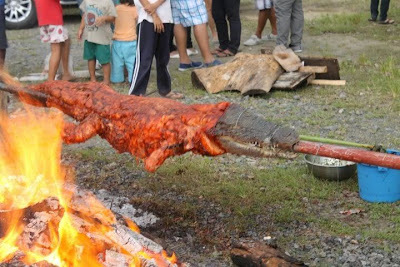 Roasted over hot charcoal fire for well three hours, the croc's edible meat emits a distinctive pungent smell, strong, and penetrating. While some people may regard it as somewhat fragrant and enticing, others may find the aroma overpowering and offensive. The taste evokes reactions from deep appreciation to intense disgust. Saltwater crocodile (Crocodylus porosus) is the largest of all living reptiles. It also known as the estuarine or Indo-Pacific crocodile, and is found in suitable habitats from Northern Australia through Southeast Asia to the eastern coast of India. Someone stole your photo for a National Geographic Contest. He is running 1st place and just might win with your photo. http://www.facebook.com/photo.php?fbid=601857846496425&set=o.129231660431299&type=3&src=http%3A%2F%2Fsphotos-g.ak.fbcdn.net%2Fhphotos-ak-ash3%2F526465_601857846496425_165609533_n.jpg&size=640%2C427 please take action.